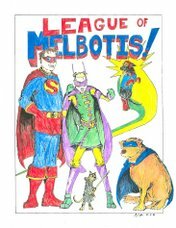 Jim has, as promised, submitted his entries to the 2004 Mellies. Good for Jim. He's not the rat that the rest of you are who have not yet submiited a nomination of any kind. Some of you are rattier than others, especially people whose names rhyme with "dandy." Thanks to Jim. I was wondering how long it would take before Fillmore showed up on the list of Presidents we just don't know enough about. I was disappointed to see Jim doesn't see the crystalline beauty in a democratic process where Al Sharpton can even manage to get his name on a ballot. I weep for Jim sometimes. If Maxwell really loves me (and I know she does), she will rush down to Midtown Comics at Grand Central and get Geoff Johns, Greg Rucka and Judd Winick to sign me some comics. If you can only get one, get Geoff to sign an issue of "The Flash" for me. If two, then get Rucka to sign the newer issues of Adventures of Superman. I am aware that seems to run counterintuitive, but I really like Johns' work on Flash and JSA. Judd Winick, by the way, is the dorky cartoonist from the LA Season of The Real World (just before the show turned into 21 Year Old Hanky Panky Fest). It was the one with Pablo and Puck, I think. Judd now works for Marvel and DC. He's currently working on some Batman comics.